Title changes for UK home video releases have become rather common of late, particularly with Metrodome releases. Now Kaleidoscope have joined the game with the upcoming release of Loser, or Lo$er as it appears on the DVD cover. Look it up on IMDb and you're unlikely to find it, and that's because it's actual title is The Grand. Quite why the title change has been inflicted is uncertain, as the film itself – an improvisational comedy in the Christopher Guest mould based around a poker tournament – is actually rather well regarded (all too often the change is an attempt to bury bad reviews or hostile IMDb comments). Zak Penn, writer of The Incredible Hulk (2008) and X – Men: The Last Stand (2006) steps into the director's chair for a film that stars Woody Harrelson (Zombieland, Rampart), comedian David Cross (Arrested Development), Dennis Farina (Get Shorty, Midnight Run), Cheryl Hines (Curb Your Enthusiasm), Richard Kind (Toy Story 3), Chris Parnell (Anchorman), Jason Alexander (Seinfeld), Ray Romano (Everybody Loves Raymond) and legendary director Werner Herzog, whose character name here is – wait for it – The German. Woody Harrelson is One-Eyed Jack Faro, a not-quite-fully-rehabbed gambler, party monster, and serial marry-er hoping to save his late grandfather's hotel-casino by winning $10 million cash at The Grand Championship of Poker. But first he'll have to beat a Vegas field of geeks, gurus, online amateurs, greedy developers, ruthless housewives, old-school pros and more of the top players in the world for the largest prize in poker history. Mike Epps, Judy Greer, Gabe Kaplan, Michael McKean, Phil Gordon and Doyle Brunson also star co-star in this no-limit comedy. 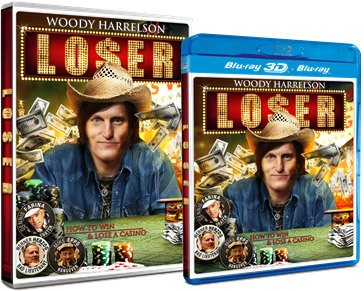 Loser will be released on UK DVD and Blu-ray and (groan) 3D Blu-ray by Kaleidoscope Home Entertainment on 30th April 2012 at the RRP of £12.99 for the DVD and £19.99 for the Blu-ray, which will include both teh 2D and 3D versions of the film. No extra features have been listed by the press release.